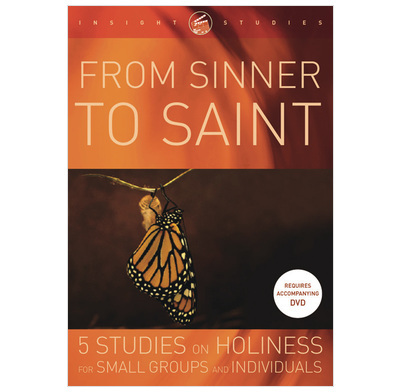 A workbook to help you explore what holiness is using the From Sinner to Saint course. Over these five studies you will explore what holiness is, how it is possible and how God is going to bring it about in your life. You will be challenged to persevere on the path to holiness and warned of the distractions you may encounter along the way. Finally, you'll be encouraged by the grandeur of God's plan for you in his new creation. This workbook gives you the road map for each study, with Bible passages to investigate and questions to think through. The DVD which accompanies these studies (sold separately) gives you extra input from well known Bible teacher John Chapman and will help you tie together the various strands of the Bible's teaching. Have already studied this once with my house group and now doing it again with new people who are finding it excellent but must have the DVD - John Chapman is SUPERB a shame you don't do more such studies. He talks in such an easy going, simple style - great. We are using the booklet along with the DVD for our Home Group. The group are enjoying the course immensely and gaining a lot from it. We feel the DVD presentation is easy to follow, communicates well in 'ordinary' language and uses God's word to real effect. We feel the teaching is absolutely in line with Scripture. Hope there are more courses in this series. I did this course myself and then lead it in a home group using the CD and workbooks. Great Bible content and the usual excellent insight which we have come to expect from John Chapman. There is a lot of ground to cover and my group took longer than suggested to complete the studies. The materials do a great job of explaining our predicament, God's plan for holiness and how we should apply these materials day to day. We used this course with a mixed group which included not-yet Christians, new believers, and established Christians & everyone found it helpful & refreshing, It is very Gospel -centred & clearly conveys the holiness of God & how sinful people can be reconciled to Him, as well as practical help on living a life worthy of Christ as His holy people. The mix of Bible study & DVD clips was well-balanced, & John Chapman's teaching was crystal clear, down-to-earth & jargon-free, as usual. Workbook clear, easy to prepare, good questions & not too many of them!Already planning to use it with another group soon. Our cell group used this book and the accompanying video during Lent and by the end of the course we all felt we had grown spiritually almost without realising we had done so. That is what is so good about these resources as they are all taken in easy stages but yet eventually leads one on to the completeness and theme of the study and one suddenly realises how much we have learnt and benefitted from them. John Chapman on the video is excellent so down to earth and some of his stories are very funny yet so relevant, it wouldn't be the same without his wonderful dry sense of humour. We could all recommend it. This is focussed home group or 1:1 material for picking people up whose profession is ambiguous and also for professed believers to find a helpful starting place to move on in their walk with the Lord. It starts with working through on becoming a Christian and takes you through to getting into determined discipleship. I felt that lesson 2 had enough material for 2 sessions. The discussion material can be used to create space for talking through problems and confusion.